It seems like a simple question, but to other small companies the task can be daunting. Even ridiculous, unless you have 100’s of thousands of dollars to throw around - you're on your own! Calvin Lee, of Mayhem Studios, gives his thoughts on the topic, what the client should know up front. "As a designer, I want to be honest and upfront. Let the client know what they will be expecting in deliverables and how much the project will cost. This can be accomplished with a signed contract and a 50% deposit before starting any project, with the exact details of what the client will be receiving." 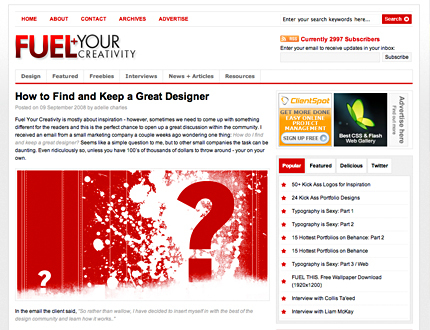 You can read the full article and discussion at Fuel Your Creativity. Fuel Your Creativity is an open site and forum where everyone is welcome (and encouraged!) to exchange ideas and tips. It’s not just for designers either. Writers, photographers, graffitists…come one, come all. There are new posts a couple times a week and sometimes more than that. Check back often. It is our hope that you will… Find your spark. Adelle Charles is a Designer & Blogger who runs Fuel Your Creativity & AdelleCharles.com. She is an obsessive email checker and highly addicted to Starbucks. Loves to add "fuel to the fire" any chance she gets. Her dogs Chino and Jameson jot down ideas for her while she's at work. They are obviously the secret to her success. What Can You Write Off On Taxes?